Here with in our coloured A4 card range, we hold a spectrum of colour to help you breath life into your latest creative project, and fight off the greyness all around us and bring your communications to life. 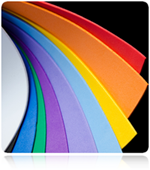 This range of coloured card A4 varies from the gentlest pastel shades through to the deepest of colours are all suitable for inkjet and laser printing, plus they all perfect for embossing and foil blocking. The full range is FSC certified and produced from sustainable forest products. Some colours within this range are available in A3 please see other categories.